Cases of poisoning with poor-quality meat very much. To avoid this, you need to carefully treat the purchase of perishable products and do not hesitate to consider the item. To reveal the fresh product is quite simple, it differs from the tainted color, smell and density. The most reliable way to determine the freshness of the meat is to put pressure on it with your finger. If the surface quickly took the same form, so meat is fresh. After lying longer than the period at room temperature or chilled, meat loses a dense structure due to the loosening of the fibers. After pressing stale meat takes its original shape. Meat colour can be from light red to dark purple, this parameter depends on the age of the animal. But fresh meat should not be extensive dark spots, they appear when the product is more than 24 hours at room temperature. 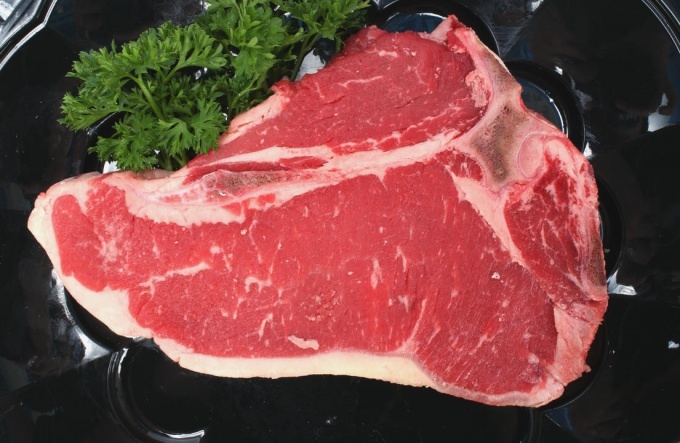 Of course, on the surface of the meat may be dark streaks, often they are the result of the allocation of iodine from the fibers is not harmful to health. Refuse to purchase meat that has a greenish tint. Although sellers and argue that it is oxidized by oxygen, but it is not. To judge the meat by the color of fat is impossible, it can be both very bright and dark. But the color in no case should not be bright yellow or brown. If you notice the meat with the color of the fat, it is possible that the animal was sick. On the surface of the fat should not be moisture. Touch fresh meat is slightly moist and smooth. If you make a small incision and push, then it needs to go transparent aloe juice. Stale meat juice is turbid, the surface may be generally dry and overly humid and very sticky. The smell of quality meat should be pleasant, sometimes with a slight flavor of milk. If the aroma has unpleasant notes, it can be concluded that meat spoiled. Try to buy only meat that you like in color, smell and does not cause any suspicion. When choosing meat it is better to be safe than to severe poisoning.